Even IT environments that have two-factor authentication in place must still deal with many different types of passwords: service account, local account, Windows local administrator and Unix/Linux root account passwords. Managing them in a way that meets requirements can be a tedious full-time job, and can make even a “simple” job, like applying a hotfix, a complex, multi-step process that introduces far too much risk. 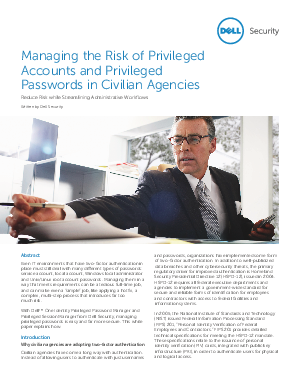 With Dell™ One Identity Privileged Password Manager and Privileged Session Manager from Dell Security, managing privileged passwords is easy and far more secure. This white paper explains how.